GIS users are increasingly demanding maps on the web. The technology to support this has advanced rapidly in the last 10 years. To create a web map using an open source map server hosted on an Amazon EC2 virtual server, see the Web Maps Introduction page. 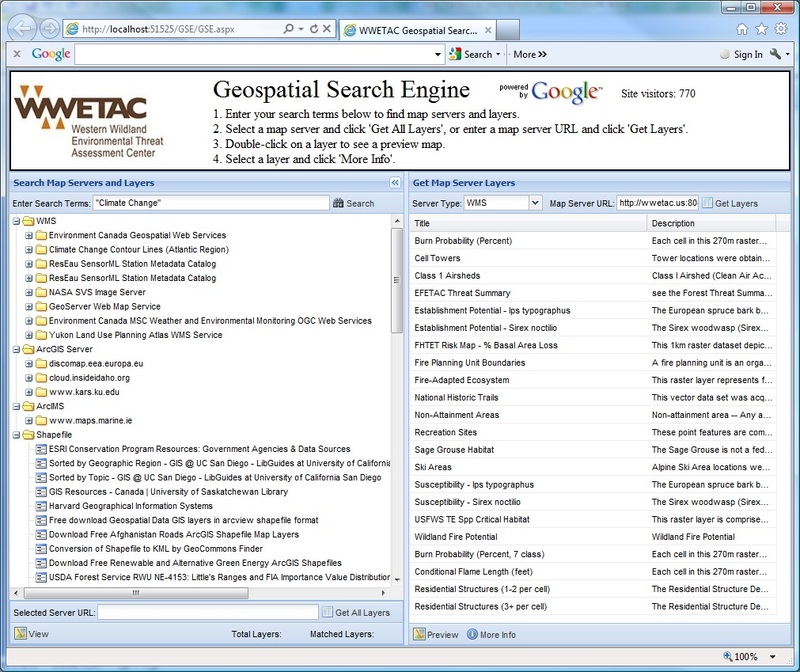 WWETAC Geospatial Search Engine, Benchmark Research and Safety, Inc. The Geospatial Search Engine (GSE) is a web application created by the Western Wildland Environmental Threat Assessment Center (WWETAC). 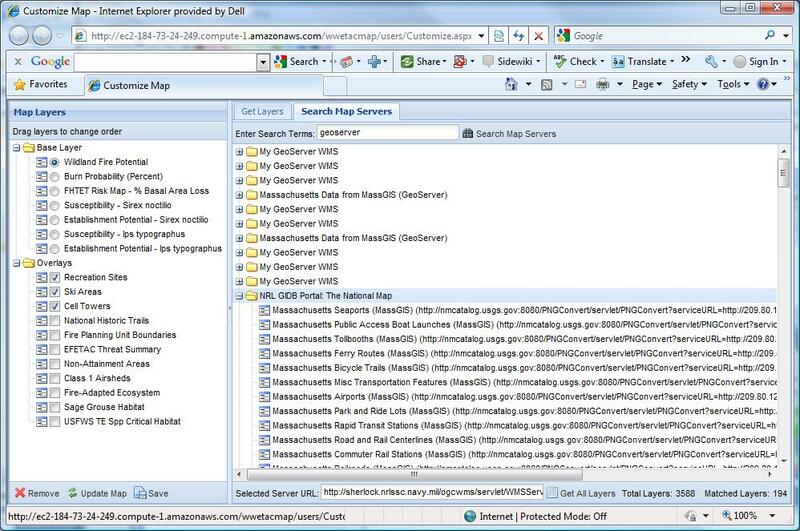 GSE provides a search engine for Geographic Information System (GIS) map servers and layers. GSE supports web map services (WMS), ArcGIS services, ArcIMS services, and shapefiles for download. The application is hosted in the Amazon Web Services cloud and is available at http://www.wwetac.us/GSE/GSE.aspx. 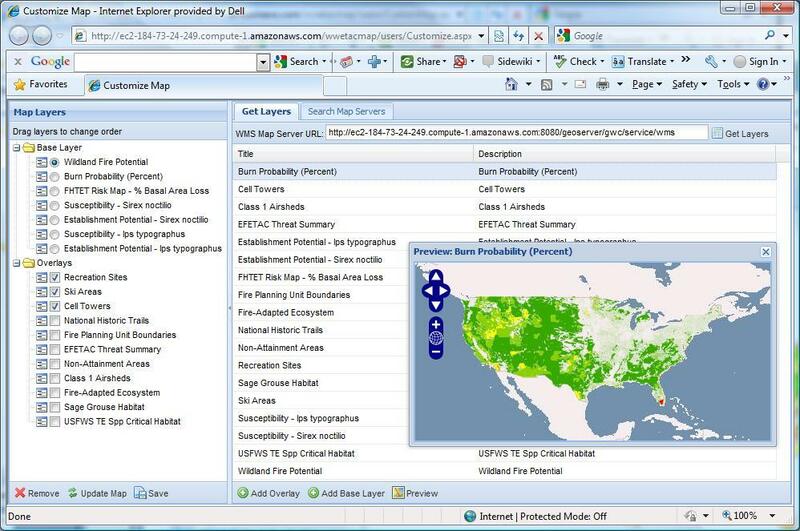 This system combines a searchable database of GIS map servers and layers, with a web crawler for both locating new data and updating existing data. GSE is currently a standalone application, but there are plans to build a user friendly API to allow further access to the search engine. The GSE user interface is built using open source components such as Ext JS, GeoExt, and OpenLayers. The Google Web Search API is integrated to obtain web search results based on user specified terms. For more details, read the Geospatial Search Engine Introduction and Geospatial Search Engine Technical Description. WWETAC Threat News Explorer, Benchmark Research and Safety, Inc. 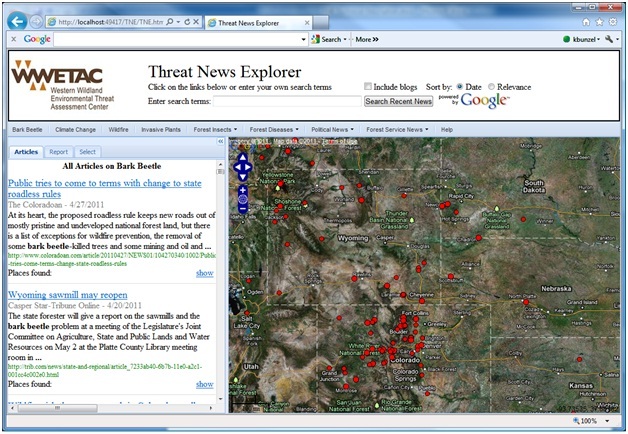 The Threat News Explorer (TNE) application was built for the USDA Forest Service Western Wildland Environmental Threat Assessment Center (WWETAC). TNE facilitates assessment of wildland threats by collecting and displaying news articles on the web that discuss these threats. The user can view the latest, all, or selected articles for specific predefined threats such as bark beetle, climate change, etc. There is also an option to enter your own search terms and retrieve a list of articles retrieved from a Google news search. Articles retrieved from a user specified search are not saved. The application is available at http://www.wwetac.us/TNE/TNE.aspx. Using the TNE application is simple. Users have a choice of either selecting predefined wildland threats, or entering their own search terms at the top of the page. The application display area is divided into two sections. On the right is a map displaying the locations of places discussed in the articles. The left side of the display contains a tabbed interface. The application is hosted in the Amazon cloud and utilizes the Google News Search API to create a database of news articles for specific predefined threats. Each threat is searched on a daily basis and the results stored in a database on the TNE server. The server makes a copy of each news web page for internal use. During the process of collectiong articles, the TNE application also searches for known places discussed in the articles. This process uses Yahoo's PlaceMaker web service for identifying places in the web page text. The process of identifying places relevant to the article can be difficult. It is possible for the PlaceMaker web service to simply make a mistake in identifying a place. We attempt to remove incorrect places or places not relevant to the article through an internal ranking and filtering system, and also through manual edits to the database. The places are displayed on the map as points. The user can click on a point to view a popup window for the place. This window will list each article that discusses this place, along with clips of the article text that contains the place name. For more details, read the Threat News Explorer Introduction and Threat News Explorer Technical Description. 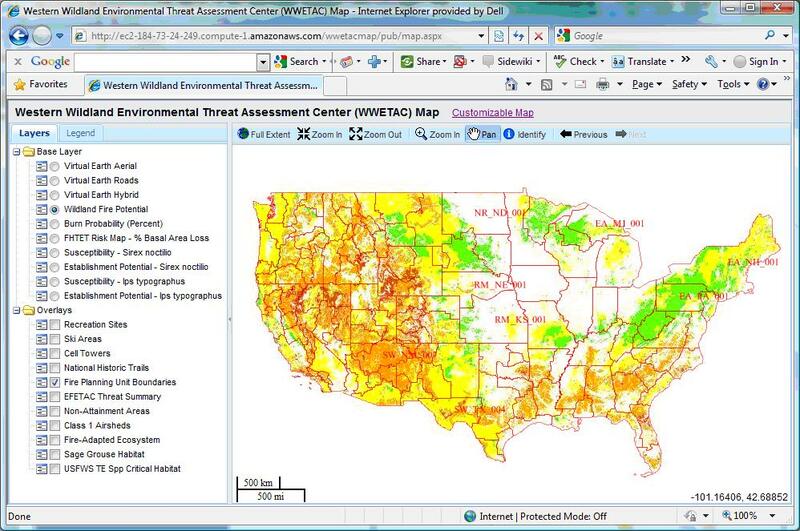 WWETAC GeoServer Map, Benchmark Research and Safety, Inc.
Kingbird Software contracted with Benchmark Research and Safety, Inc. to develop a web map application for the Western Wildland Environmental Threat Assessment Center (WWETAC). This application is a continuation of the feasibility study for deploying an open source map server in a cloud computing environment. The application consists of an open source map server (GeoServer) set up on an Amazon EC2 instance virtual server. A thin map client in a browser was created using open source components such as OpenLayers, GeoExt, and Ext JS, to view the layers. This application also consists of customization tools that allow the user to search for existing web map services and add new map layers to the map. The layers can also be reordered, and removed from the map. Changes to the map can be saved on the server for each user login. The map also incorporates a web map service search engine created by MicroImages. The search engine allows users to enter search keywords and retrieve a list of web map services that meet the search terms. The user can then preview and add to the map any of the map layers served by the web map services. This application is described further on the Web Map Designer page. This map can be viewed live here. 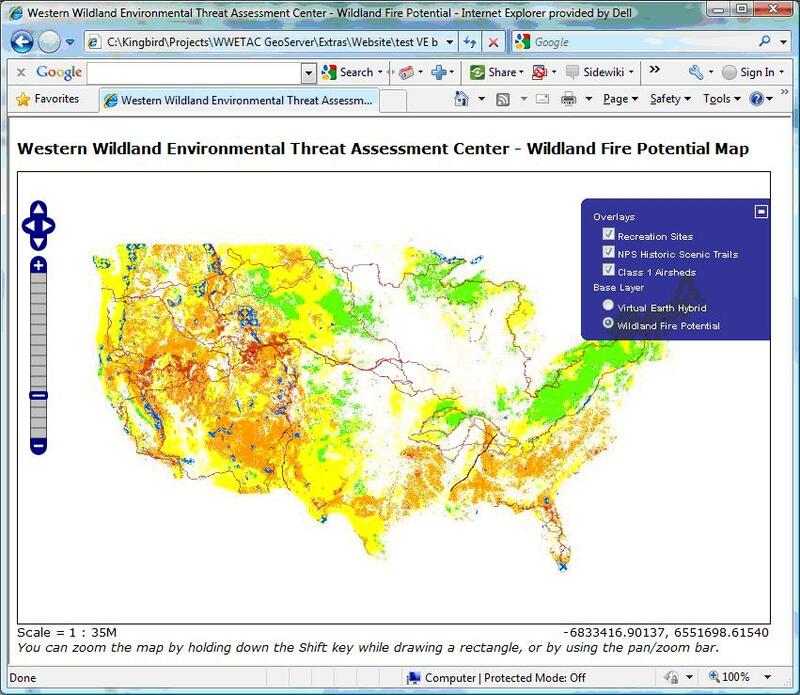 Kingbird Software contracted with the Western Wildland Environmental Threat Assessment Center (WWETAC) to conduct a feasibility study for deploying an open source map server in a cloud computing environment. A prototype web map was created by setting up GeoServer on an Amazon EC2 instance, and using OpenLayers to create a thin map client in a browser. This study involved testing an open source map server on a virtual web server and using an open source map client. The use of Amazon Web Services (AWS) allowed a quick and inexpensive map server deployment. This application involved GIS modeling for the City of Emeryville and Emeryville Redevelopment Agency as part of the Brownfields Pilot grant. While employed by Pacific Meridian Resources, Ken Bunzel developed a GIS map for the Internet using Visual Basic and MapObjects development software where interested parties can obtain land parcel information as well as data collected from numerous soil and water samples taken at brownfields sites. Ken Bunzel expanded the City of Emeryville’s Internet map to include another module to display real estate listings. Available properties for lease or sale are displayed on the parcel map color coded for the type of property, along with text information and photos. Real estate brokers can add and remove listings to the map under their name using secure online forms. The City receives the new listing information through application generated emails and reviews them for accuracy and content. An administrator toolbox allows the City to make the new listings visible on the map and upload photos to the site. Oglethorpe Power Company manages a database of available industrial sites and buildings for the state of Georgia. Because these sites represent potential customers, Oglethorpe wanted to provide data and maps of these sites to the general public over the Internet. While employed by Pacific Meridian Resources, Ken Bunzel developed an interactive map for the Internet using Visual Basic, MapObjects and the MapObjects Internet Map Server software. This application allows the user to select sites or buildings and obtain information on them by clicking on the map. In addition, the application provides the ability to navigate the map, select sites or buildings by entering search criteria, and display additional layers such as roads, cities, airports, streams, counties and railroads.